Today Kittie returned to Well Walk, Hampstead, from staying with the Pyms and Lubbocks in Kent. The Belgian refugee Jean Ryckaert, who had been living at the Calderons’ since October 1914, had recently left, whether for a job in central London or for unoccupied Belgium is not clear. The last of the three refugees, Raymond Dereume, may still have been living in the house whilst he applied to emigrate to the United States, where he had a very successful future ahead of him. 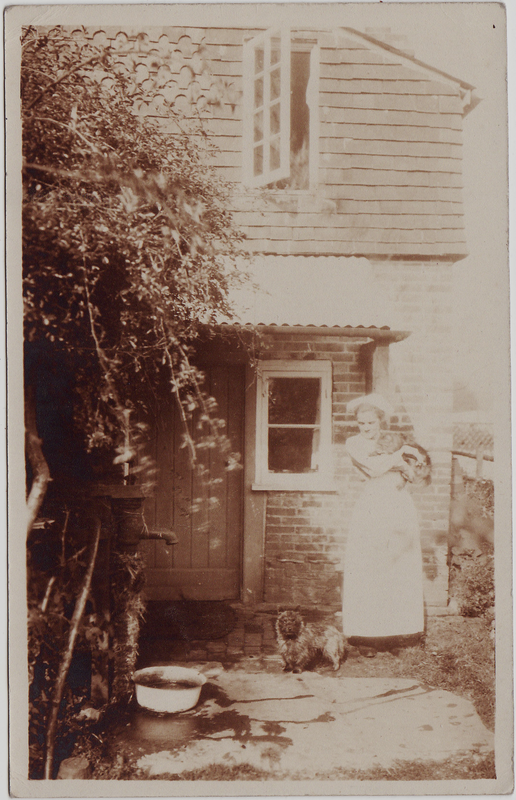 The one person who was certainly there to greet Kittie was her housemaid Elizabeth Ellis, who lived in. Ellis had probably gone to work for the Calderons when they moved to Well Walk in the last quarter of 1912. She was an Anglican and did charitable work for the Girls’ Friendly Society. She stayed with Kittie for the next thirty-five years. The parsons are good fellows and sportsmen; they preached all over the ship on Sunday; hold a communion service of nurses every morning before breakfast; and the senior of them refereed the officers’ boxing. There is a tall fat one who thinks and talks chiefly of food; relates adventures in which he ‘missed a meal’; rang up the steward all night in the Bay of Biscay to ask if the ship was sinking, and troubled Hogan every hour, when a guard, to enquire as to the dangers of being torpedoed. On the back of this letter, it may be remembered, he had confirmed that they were bound for Lemnos. Because she had already received his letter of 30 May, she knew that he was at Gallipoli; but now his letter of 27 May described their arrival at Helles the day before. This was a brilliant letter, written with great verve and immediacy, that also started with a long Tolstoyan sentence, touched on everything from the ‘young moonlight’ to corncrakes and lizards, included the black humour with the unexploded bomb, and was utterly reasssuring — much more so than the one of 30th, when several men near him had been wounded and ‘about 80’ Turkish shells had landed in and around their camp. The sequence of George’s letters had now been restored and only those of 1 and 3 June were left for her to receive. This entry was posted in George Calderon, Timeline and tagged Alexandria, Dardanelles, Elizabeth Ellis, Gallipoli, George Calderon, Hampstead, Helles, Jean Ryckaert, Kittie Calderon, Lev Tolstoy, R.M.S. 'Orsova', Raymond Dereume, The Great War, Well Walk, World War I. Bookmark the permalink.